Bubble football comes as a new kind of sports for everyone to enjoy the weekends, holiday parties as well as other events in a thrilling manner. It combines football play with a gigantic zorb ball of 1.6m diameter that is wrapped on the player from head to waist with just their legs being free to move. The objective of bubble football is to score more goals than of the opposing team. Players attempt colliding with each other during play, implying the entire exercise becomes hilarious, in turn earning the game the term Bubble football or Bumper football. Tackling takes place in a unique way as it does not involve the feet, but instead knocking other players off the ball. Bubble ball has a goalkeeper just as the regular game of soccer, who has to keep the ball from getting into the net. This game is more light-hearted compared to regular football, however. It is meant to be hilarious and the rules of play therefore are much more relaxed to allow for maximized enjoyment by participants and spectators alike. 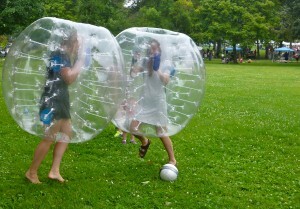 Two teams comprising of seven players wear the bubble suits before engaging in a chase for the ball. A football pitch, clear and open grass fields as well as indoor sports hall are suitable for playing this game. As well, it is entirely safe to participate in and does not lead to any injury when a player hits the ground. All ages can enjoy taking part in bubble football. Expect to laugh yourself silly while having lots of fun with friends, colleagues or members of the family. Game-play does not involve any hard rules, in which competition involves scoring goals without being permitted to handle the ball. You can experience the fulfillment of playing bubble football at different times. These include during parties, clubs, hens and stags, team building, corporate, campaign, schools and Bachelorette parties among other events. Watching players as they participate in this game is quite a thrill too. They lose balance and fall over each other while exhibiting their football skills. This is a fantastic game to play during a local community event for instance and you can buy Bubble football early as part of the preparation process. Some sports fans, especially those who like physically-demanding games like GAA or rugby do not see football as a tough sport. Bubble football incorporates this deficient physical element while yet reducing injury risk. Players remain protected at all times through the giant and inflatable bubble football suits they wear. Hardly could anything go wrong when playing in such state. The new soccer game introduces an entirely new meaning to ball control. It was created by Lee Moseley, who worked initially as an asbestos surveyor. This game does not hurt and you can bounce back into upright form after landing in a good position. You might find it slightly challenging rising up again while laughing at fellow-players. Anyone who plays the game of should look forward to experiencing repetitive moments of excitement. Find good bubble football for sale to optimize on fun through this very innovative kind of sports activity.